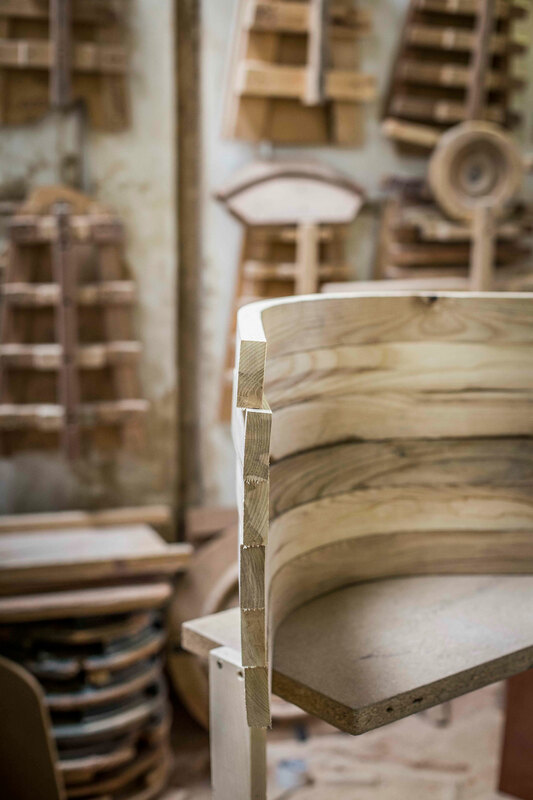 The art of creating bentwood furniture involves an intricate production process performed by craftsmen with a variety of specialised skills, one of which is the post machiner. 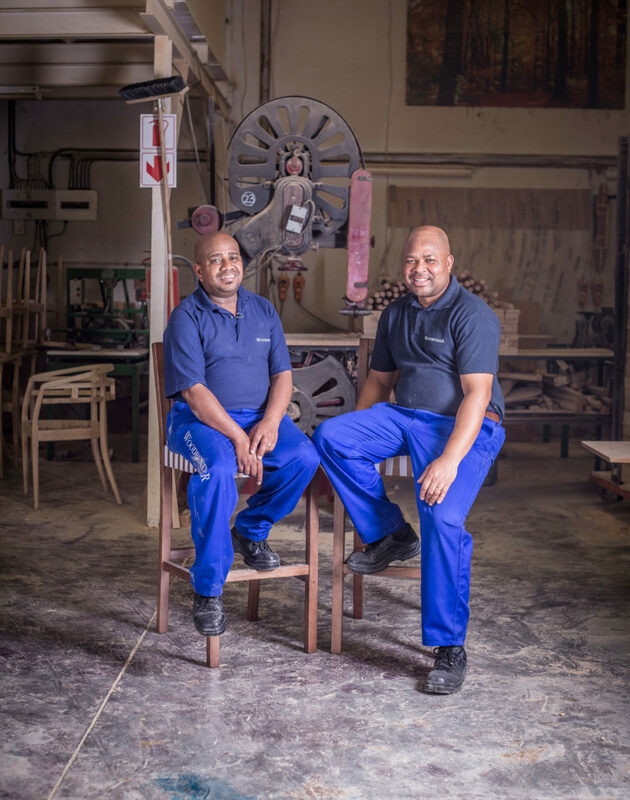 These craftsmen receive the pre-cut and bent component parts for the furniture from the cutters and benders. They then identify what the specific wooden parts are and prepare them as necessary for sanding and assembly, which could include pre-drilling holes in the wood, trimming it to different lengths, shaping parts and routering. One of the main skills required by a post machiner is to know exactly what preparations need to be done to each component part and to perform these steps in the correct sequence. Once the parts have been fully prepared, the post machiners pass them on to the sanding team to smooth the rough edges and create a silk-like finish. 1. How long have you worked at Woodbender? Eric: I’m going on 21 years now. Elliot: I’ve been at Woodbender for almost 20 years. 2. Which department did you start in when you arrived at Woodbender? We both started working as sanders before moving onto post machining. We’re responsible for preparing all the cut and bent wooden parts we receive with the required shaping and drilling of holes, before the parts move down the production line to the sanders and assemblers. 4. What is your favourite part of the post machining process? I think we both enjoy being able to work on the multiple machines in our department, and overcoming the technical challenges of knowing which machines to use when. 5. What is your best thing about working at Woodbender? We love the atmosphere and attitude in the company. Our team really works well together. 6. What are the main challenges with your job? Our first concern is about our clients, and remembering that they need to be happy when they receive their furniture. We also have to make sure that the parts we receive from the cutters and benders are correct and in good condition. Thereafter we need to know which jigs and processes are required for that specific part. 7. What skills or techniques make you good at your job? Throughout our years of experience, we’ve learnt to know what imperfections and faults to look out for, such as skewness, natural cracks and incorrect wood density, which can indicate that the wood is not suitable. We also have to know which pieces of wood are best used on different parts of the chairs. 8. As the longest serving men in the Woodbender factory, what is your advice to people who start working at Woodbender? We’d say they need to arrive ready to co-operate and learn from the other people in their team. They also need to be proud to be a part of Woodbender, and to appreciate that working here is different to anywhere else and that they’ll learn a lot as part of the team. Prepared bent and machined parts ready for sanding.